On our way back to the main road, we found a board that read, "Police in your service - Gangapur Road". We were surprised to see that sign. Amjad our jeep driver told the story, "Some two years ago, a naxalite came to this village looking for shelter. The villagers thought he was a dacoit and started to beat him up. He pleaded with them saying that he was a naxalite and not a dacoit. But the villagers thrashed him and handed him over to the police. The police recognized him as a wanted Naxalite and were very happy. The villagers gave a statement saying that the man was a dacoit and not a naxalite. Anyways, the police were happy and constructed this road for the villagers. Until that time this village had no proper access from the main road. The village did have a road earlier many decades ago, but it had been cut-off after the construction of the Kadam Reservoir. So now they have a road, thanks to that incident of mistaken identity." After a short break at the tea shop on the main road, for breakfast, we moved on to the bamboo forest on the other side of Jannaram. There was a machaan there, but only it did not seem like the traditional machaan. 'We had made a structure using bamboo and thatch, but now the forest department has made a permanent structure' Asif said. The look of the concrete block which looked like a mini-apartment block in the middle of the forest looked like an eye-sore inside that beautiful forest. 'This is typical tiger habitat', Asif mentioned indicating the bamboo forest. The machaan faced a watering hole or what seemed like one…it was a forest stream but looked totally dried up. 'This is a very common watering hole, many times we spotted the tiger here', Imran mentioned. 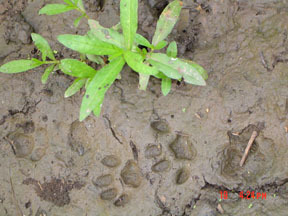 'Look, there is the pug marks, the tiger must have come to drink water here some time ago', Pranay called out. Akhil went in for a closer examination, 'no, that doesn't seem like tiger marks, more like the panther, see the paw size is much smaller'. 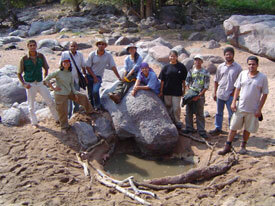 We found another set of marks, that of an animal which must have dug deep into the sand looking for water. 'This is only January and already there is no water, god knows what will happen to the animals in the summer!' One of them remarked. Very cautiously we went to the middle of the stream which had some rocks. We found wet sand. Imran sat down and started to take out the sand, 'see there is water just below the surface. If only the forest department people tried to de-silt this stream, the animals would not have to suffer'. Then we got an idea, we found one small left out bucket and some tree barks, and some of us started to dig which others began to make bunds with the sand taken out from the pit and some others collected stones and tree barks to keep the bunds intact. Soon, a small pool of water was made and the tree barks and stones were used to make bunds and keep the sand from falling in. "This water will be enough for at least ten days for the animals. I am so happy and feel I have earned some good will from god!' Imran beamed. That was an occasion for taking pictures, so all of us gathered around the little pool and took some photographs. Soon it was time to leave, and we left the forest picking up all the plastic and paper trash left by unthinking picnickers. "The animals eat these papers and plastic not knowing what it is. The plastic kills them and the chemicals in the paper give them disease', Pranay remarked. We reached our dormitory and after packing our bags and lunch at the Udupi hotel in Jannaram, took the 1.30 bus back to Hyderabad wondering what will happen to the forests and the animals if things continued the same way.